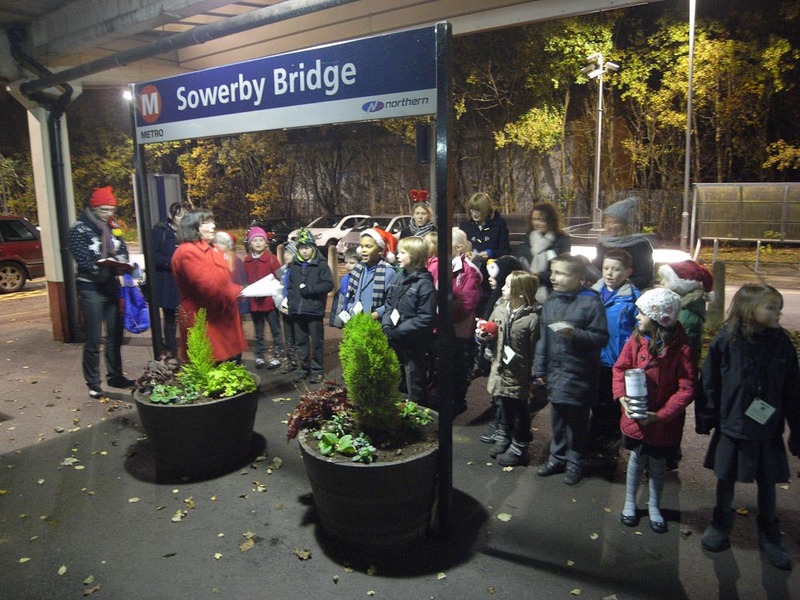 Thanks to Northern Rail station manager, Matt Gibson and his colleagues, stars from Burnley Road Academy made a fine show on the trains to/from Sowerby Bridge. Thanks also to Sowerby Bridge Jubilee Refreshment Rooms and ‘our’ Lyn at the Shoulder of Mutton. 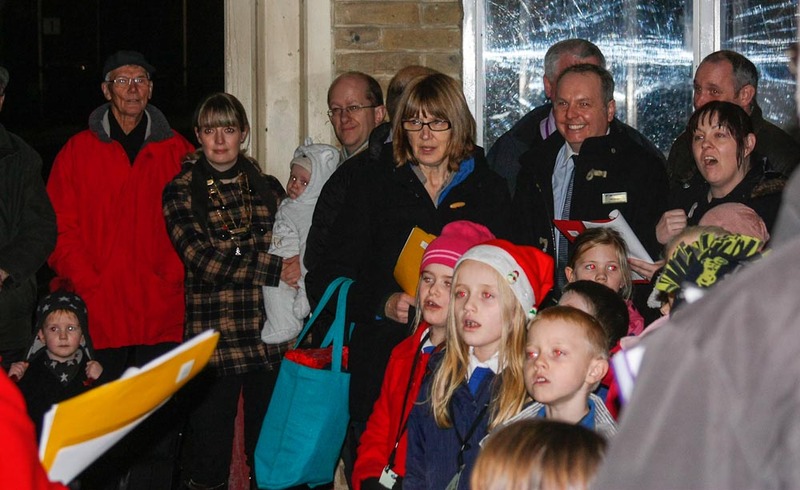 For a complete change – we organised the Annual Carol Sing to be on a train journey – to Sowerby Bridge, and back. Our Northern Rail Station Manager, Matt Gibson did a marvellous job getting all the event to work so well – assisted by his staff Diana and dave. 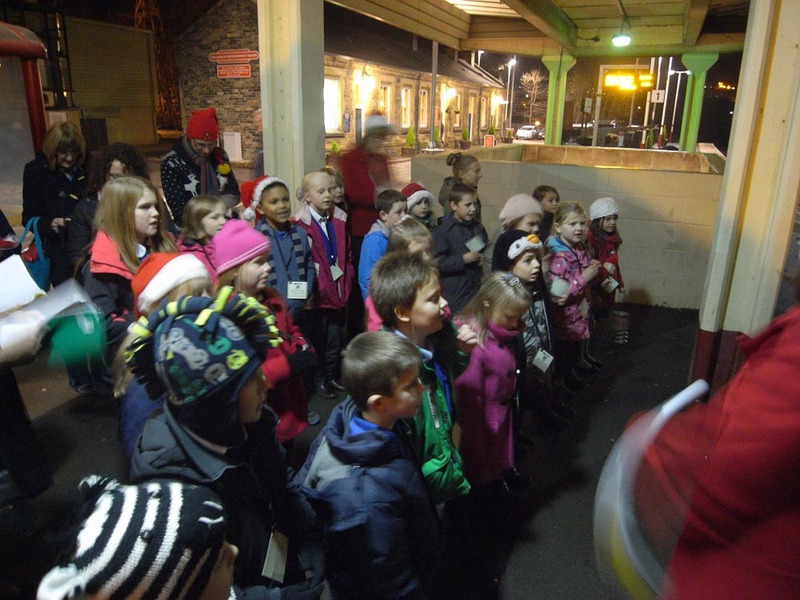 Mytholmroyd Station Partnership’s last event of our calendar year took place on Wednesday evening when more than twenty excited youngsters from Burnley Road Academy lined up on Platform 2 – ready and waiting for the 16.44 train to Sowerby Bridge. 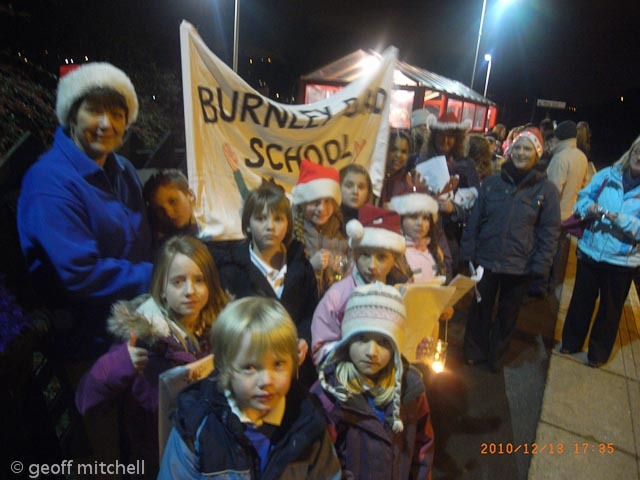 They were accompanied by the Mayor of Hebden Royd Town Council, Cllr Christine Davenporte; Head of School, Ms Pam Savile, the choir leader, Geraldine Wrathall parents and friends together with Northern Rail manager, Matthew Gibson, who had organised and arranged the trip, with his two colleagues. 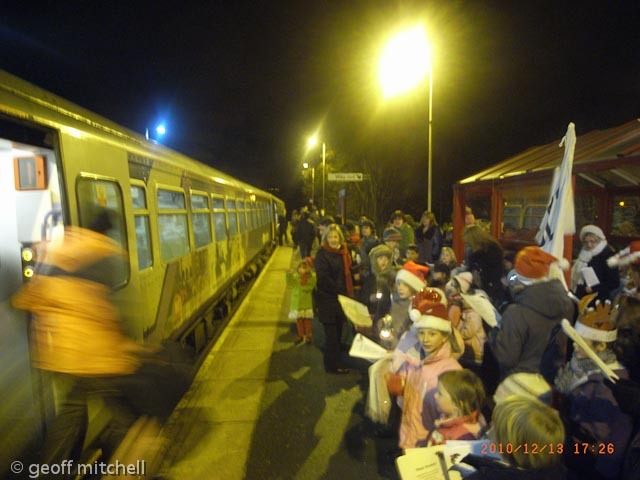 Mytholmroyd Station Chairman, Geoff Mitchell acted as co-ordinator and all round good egg. 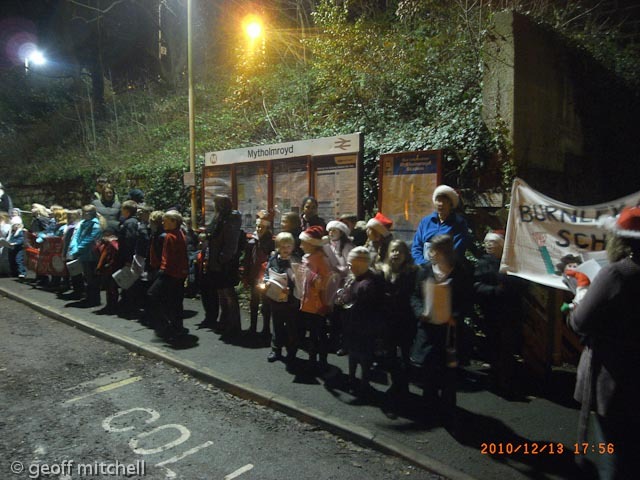 The children sang for the homeward bound travellers to Sowerby Bridge; they sang on the station; and they sang in the Jubilee Rooms – and to their delight sang for Santa Claus who very generously handed out some gifts for an evening’s hard work; while the adults gratefully supped hot cups of coffee all provided by Northern Rail and brewed by Chris Wright of The Jubilee Room. The programme of traditional and not so traditional carols was sweetly sung, and included some solos, and 4-part harmonies. They were patiently directed, and urged on by their teacher Geraldine who obviously got as much from the singing as we friends, travellers and teachers and officials did. 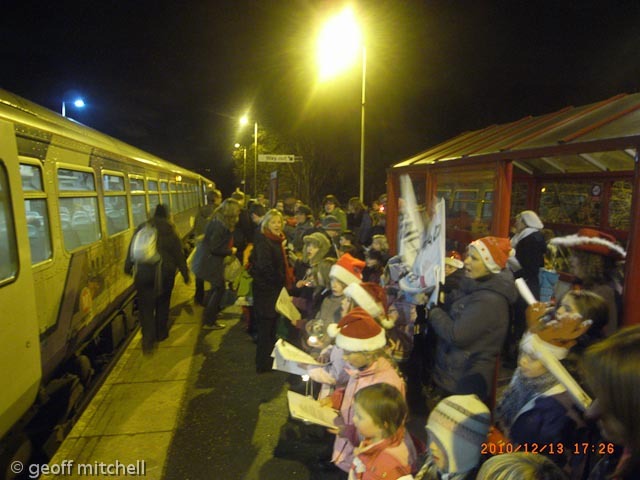 But the evening was not yet complete – back on the train for Mytholmroyd, singing sweetly as ever, where they joined their waiting parents in the newly re-furbished Shoulder of Mutton. 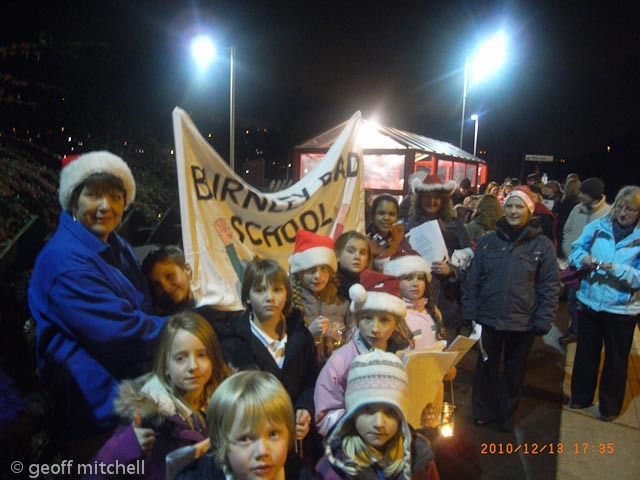 Lyn and John Hartley, proprietors, had been keen to welcome the Burnley Road Academy to the Shoulder as they wanted to thank the school for the thoughtful gift of wine and chocolates presented to them when they were coping with the aftermath of the devastating floods of June. Warm drinks and biscuits were freely available to friends and relatives. 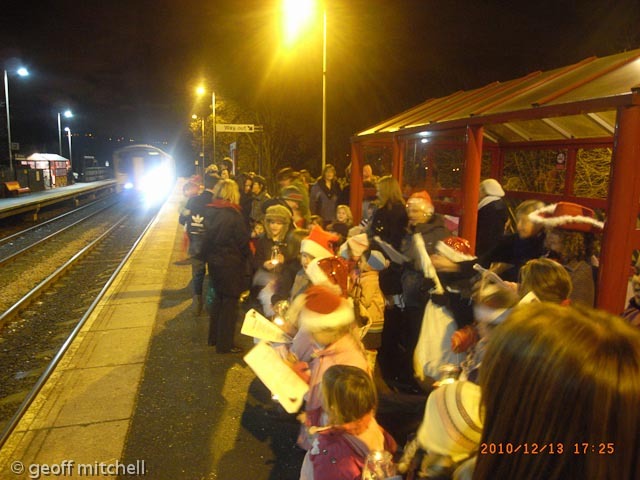 Mytholmroyd Station Partnership thanked Matt Gibson, Dave, Diana from Northern Rail, Cllr Christine Davenport, Burnley Road Academy pupils and teachers and all who participated for a memorable evening. 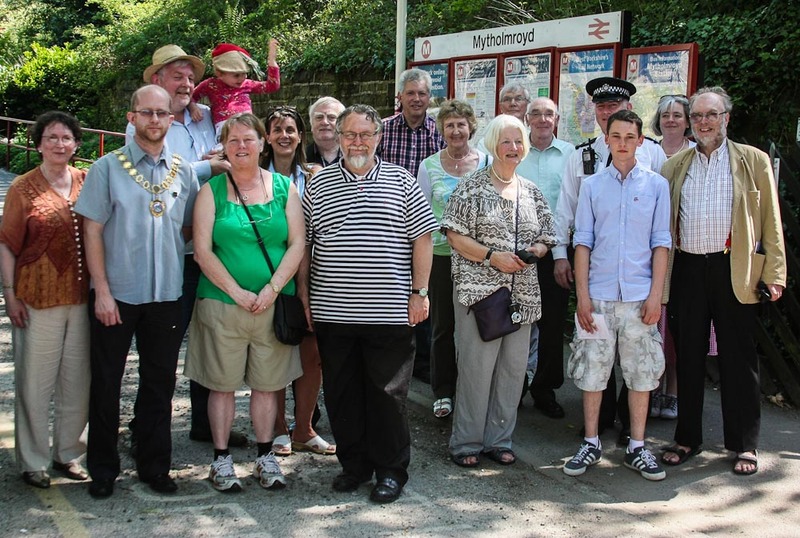 Mytholmroyd Station Partnership is open to anyone who wishes to join a friendly group of people who have transformed the village railway station to an attractive and welcoming feature of the Upper Calder Valley. 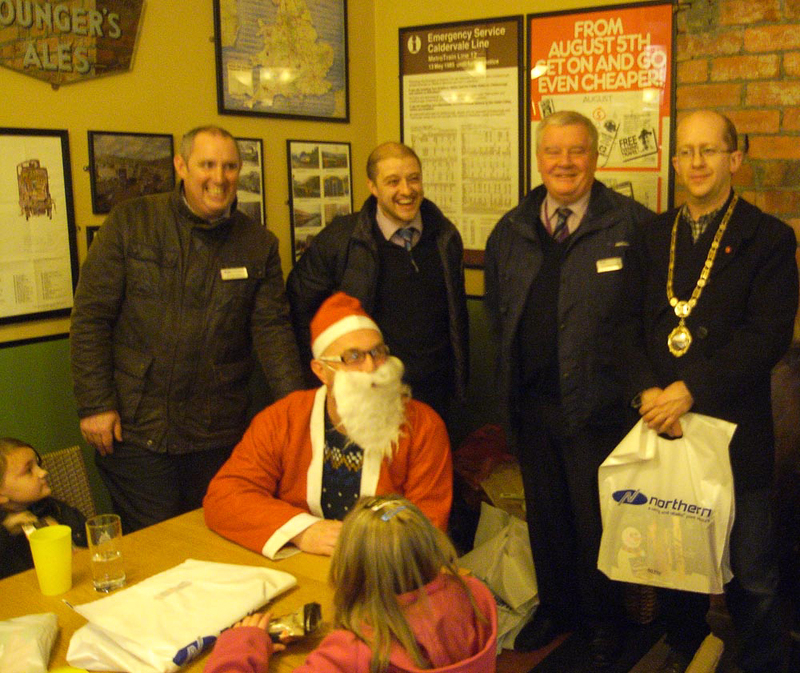 All made a very enjoyable evening – and not forgetting the inpromtu Father Christmas who stepped into his boots at the last minute! 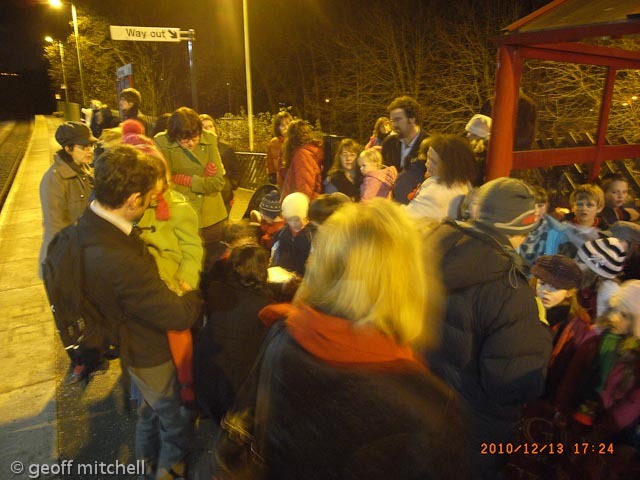 Thanks for coming to the station Do – hope you enjoyed it. 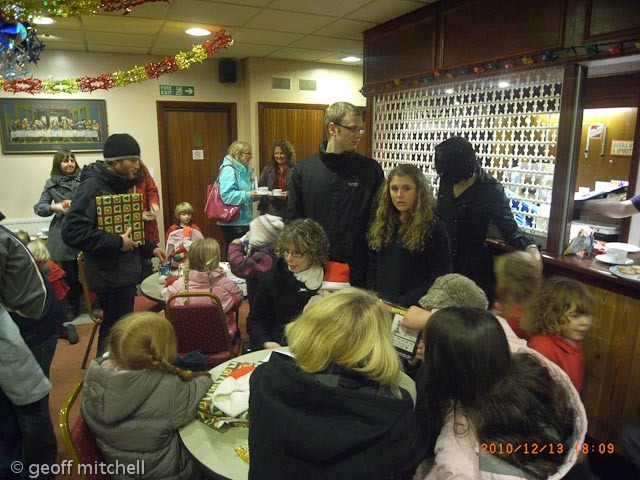 Wasn’t the food good – well those who came earlier enough or unlike me spent too much chatting around the place! What a great variety of interesting (50+) people are associated with the Station. Plans are on-going for our 2013 displays! 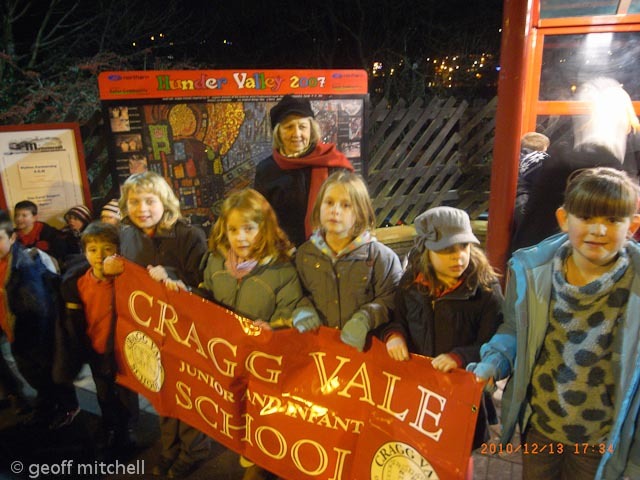 It will be the turn of Cragg Vale School artists – and we are receiving some interesting pictures of local history. Keep them coming – anything up to 1980s with local interest please. 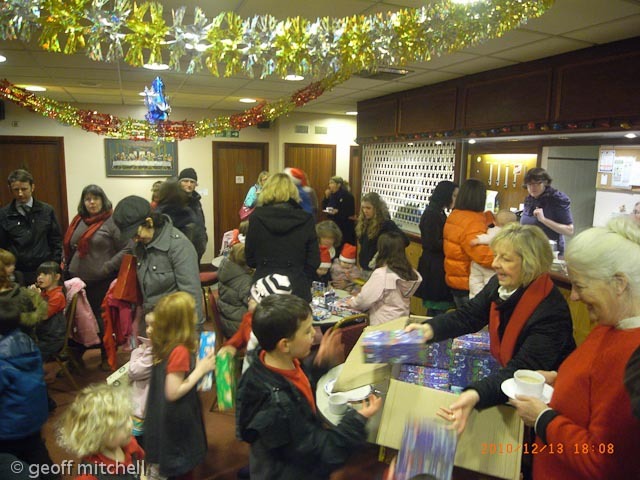 A great selection of photos of the 2012 ‘Do’ are attached. Dogoil – good for bones! The Chairman braves the Mytholmroyd sun to welcome our special guests. Click on a picture to see the fine details! 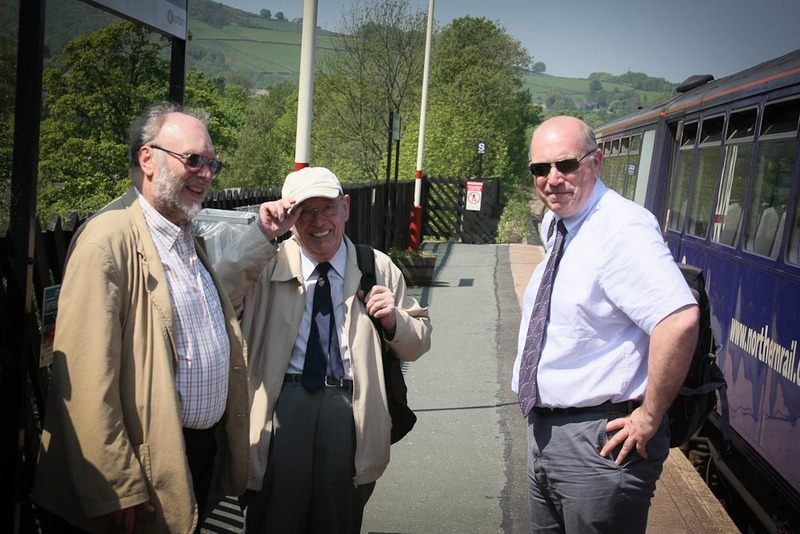 Welcome back stationmaster Harold, and to Brian (ACoRP) Barnsley all the way from the Penistone LIne. 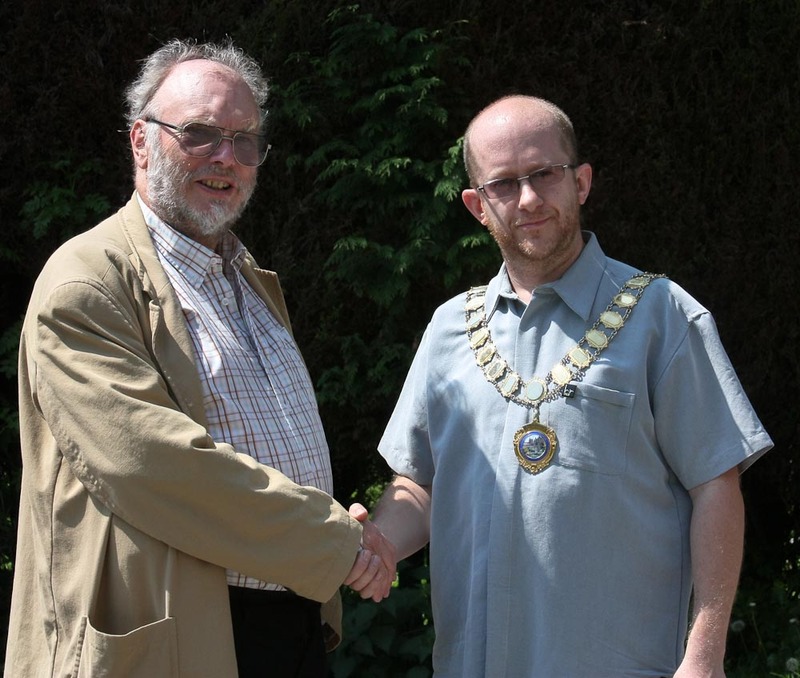 Brand new Deputy mayor of Hebden Royd, Cllr Karl Boggis comes to face his first public engagement. He is off ! – and what a good start Karl made, most enjoyable. In between bites of the delicious lunch provided by Lyn of the Shoulder of Mutton and refreshing drinks supplied by Fr John Gott and Hon. 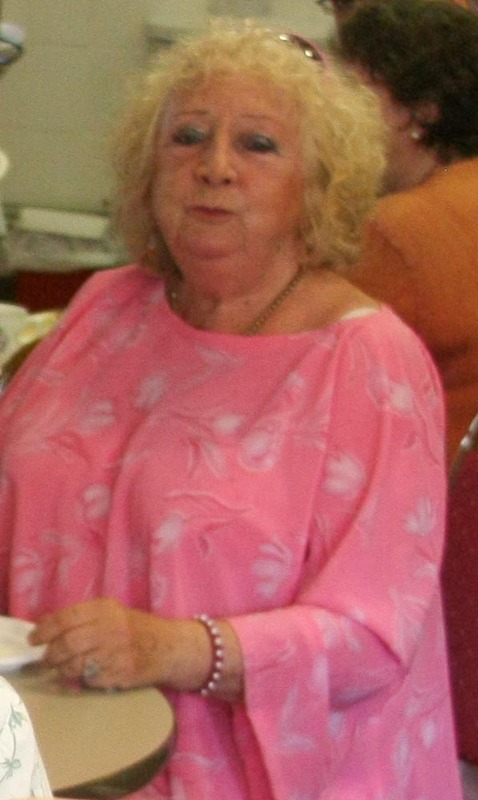 Secretary Sue – we heard how our voluntary efforts are apprecited by the wider community. Bemused whether the red braces will keep the Hon. 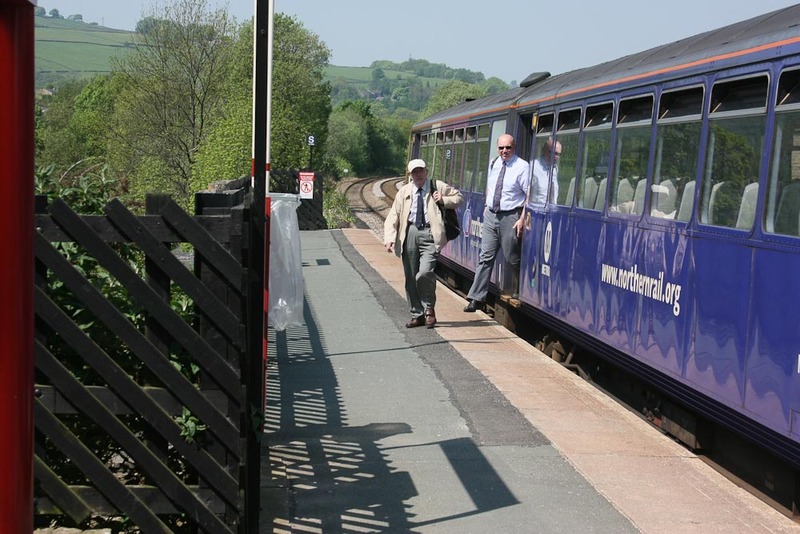 Chairman decent – Brian barnsley tries to explain the wider role of the Association of Community Rail Partnerships and how Mytholmroyd has fittied in to the national scene. 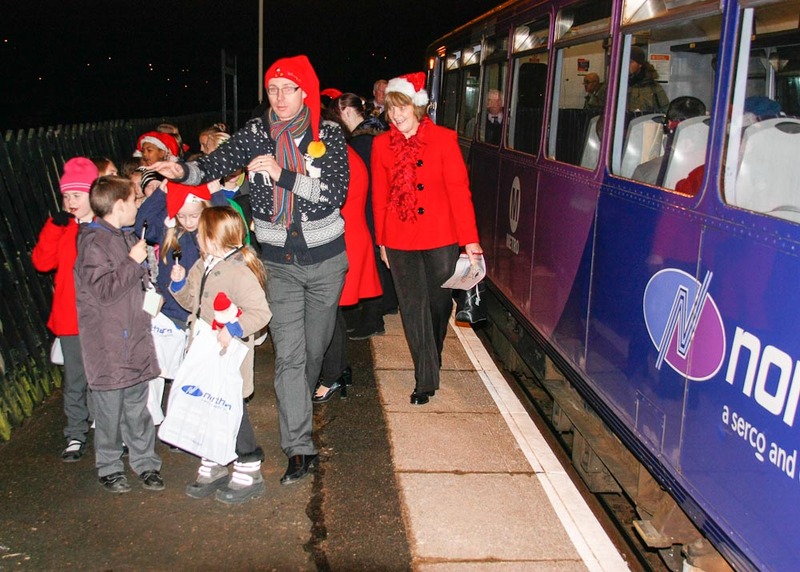 West Yorkshire stations are like what the Forth Bridge use to be like – non-stop attention. We are lucky to have two super chaps – John and Phil of the station contractors, ISS – who do us all proud. No sooner have they dealt with Walsden and they are fettling the next station along the line. 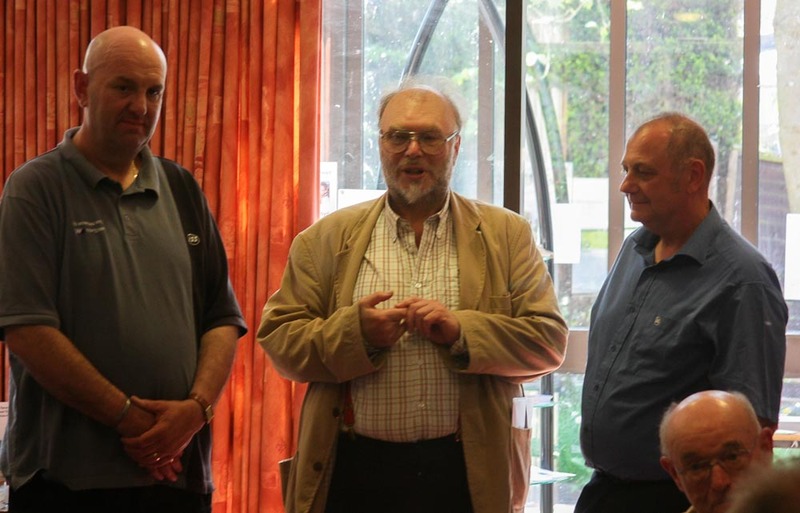 Mytholmroyd was very pleased to be able to give a small token of their appreciation – thanks John and Phil. Then the highlight of the event was to see the artwork by the scholars of Scout Road Academy – and the artists themselves. The artwork has been coordinated by local artist Annie Lawson, a generous grant from the Association of Community Rail Partnerships made the 2012 exhibition possible. The displays themselves are a the result of a landfill grant from the Green Business Network – our extended partnership of community groups. The artistic talent we see here will have the present super-stars of the art world shaking in their designer boots – world poetry in yesteryears what does the future hold for these youngsters? 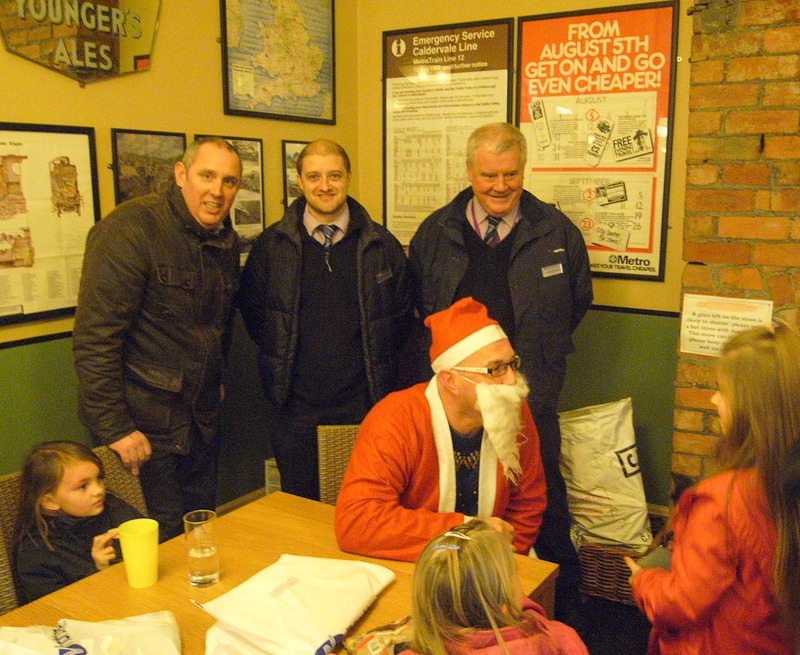 We attract all sorts of folk to our Annual Community Station lunches. 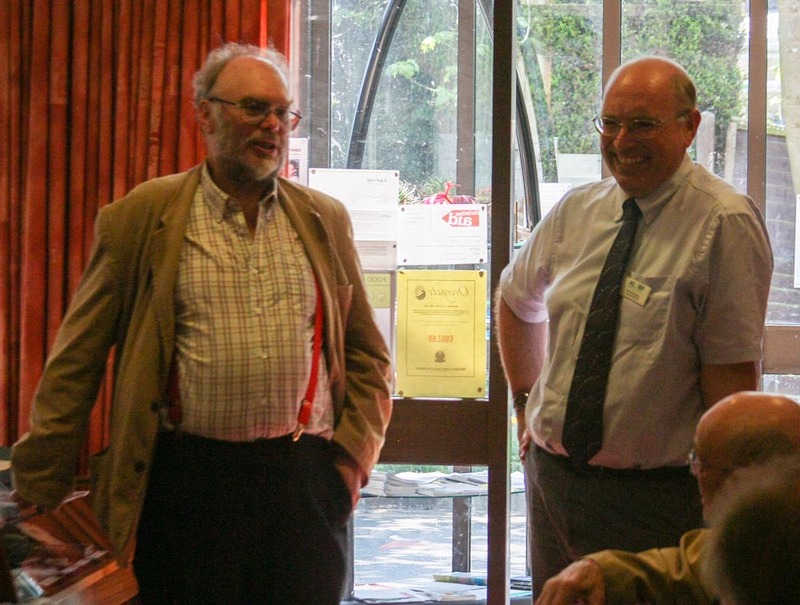 They were all welcome and proved very interesting people to meet and know. 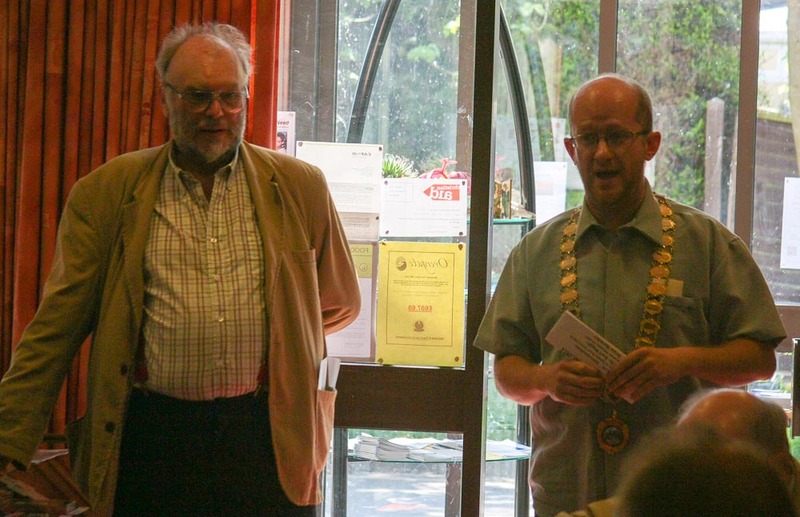 At one of the banner is ‘our’ Stuart Greenwood and hold the string at the other end is ‘our’ new Deputy Mayor, Karl. Then we have Perri Webster, tutor at Calderdale College and some of her Landscaping students who are helping the station prepare for 2012 Yorkshire in Bloom. 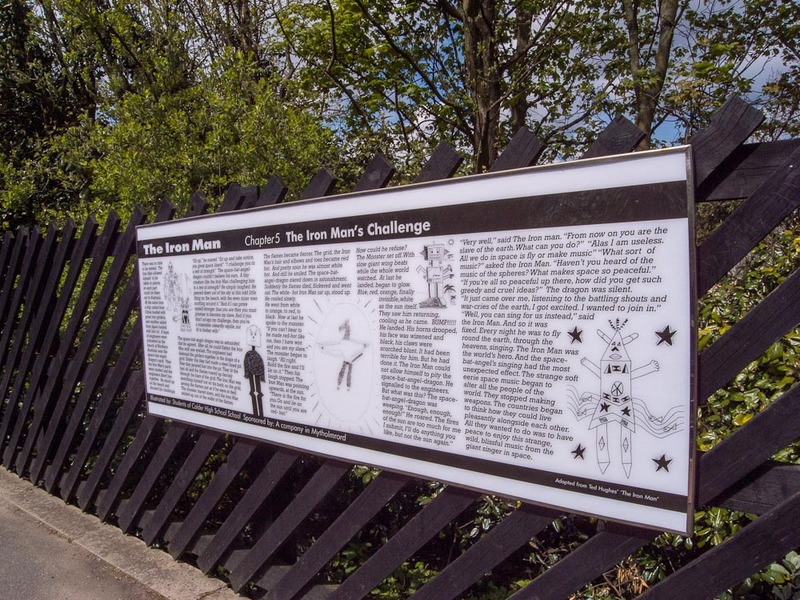 Thanks to Nigel Oliver and Green Business Network – our Ironman mural has been fully restored by local experts – Pennine Signs. Yet another busy month ahead. Friday 09 Dec at 13.30 Dig-in general tidy up of station area. 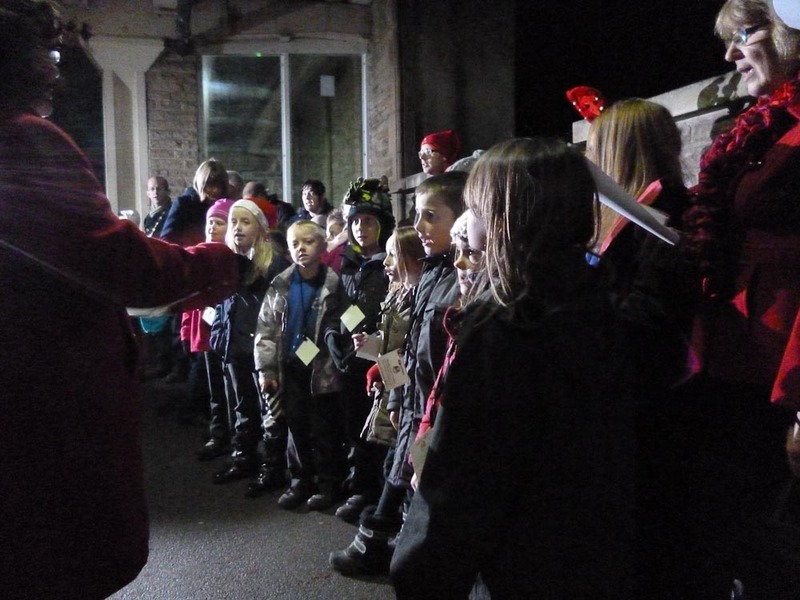 Monday 12 Dec at 17.00 – Annual Carol Sing by our Junior Schools. 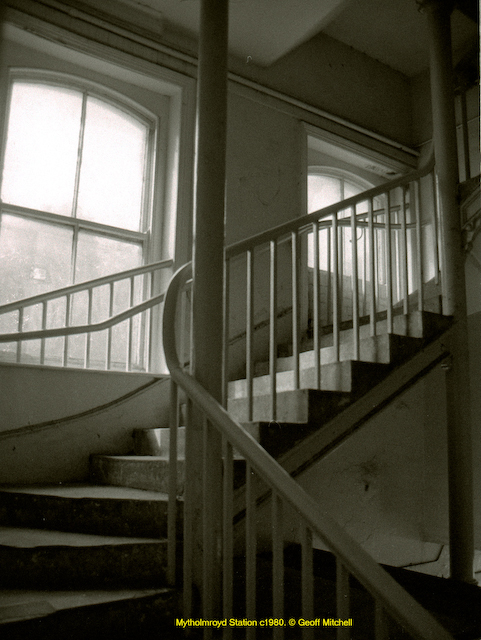 Station Building Artwork – where is it????? Now thinking of ideas for 2012 ???? without relying on grants or subsidies ———- ! What a super evening ! 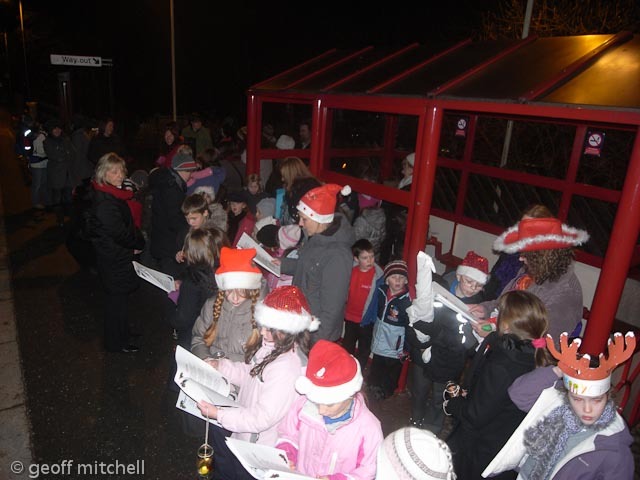 Brilliant Carol singing – wonderfully arranged and conducted. 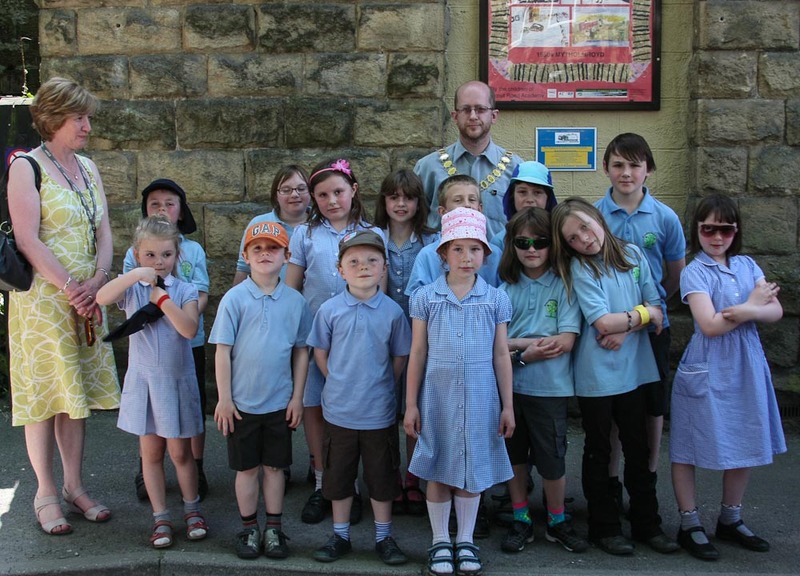 The Mytholmroyd Junior Schools show them how to do it – again. Thanks to Matt Gibson of Northern Rail for permission to sing on the station – and for the lovely presents for the singers. 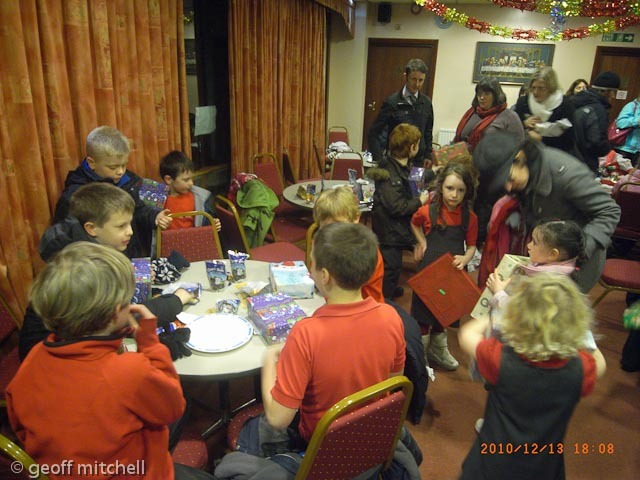 Also thanks to Mary Clear and Calderdale Safer Communities for her presents.